How to get there: From Oslo, drive Hwy. 7 to Gol, then Hwy. 52 through Hemsedal and a bit further than the county border between Buskerud and Sogn og Fjordane, see details below. From Bergen, drive Hwy. E-16 up the Lærdal valley, then take a right onto Hwy. 52. From the place where Hwy. 52 forks right, continue 13 kilometer uphill. There should be a small road going left (even in winter), and you see a lake (the first one) on your left. Park here, this is the trailhead. The elevation is 1128 meter, location N61:00.528, E008:06.460. The distance from Bergen is 233 kilometer. Driving time from Bergen is 3-4 hours depending on traffic and road conditions. Route description: From the trailhead, follow the road that runs around the west end of the lake. In winter, one may head directly by the cabins and cross the lake. Head towards Ulvehaugen (1274m). The road forks here, take the left fork as it climbs parallel, but above the river. When the valley becomes more level, you have the west slope of Jukleeggi on your right hand side. This slope can be climbed along several lines. I skied up just south of the 1554 meter elevation printed on the map (halsane). 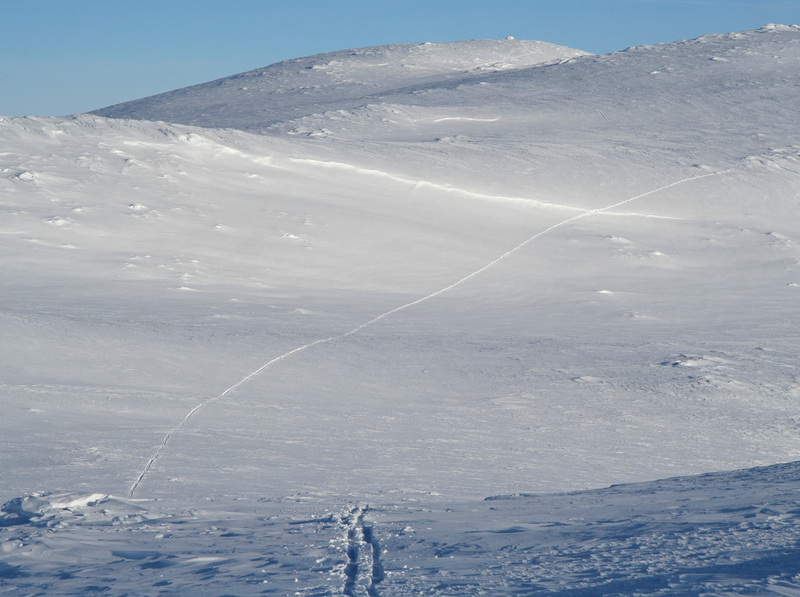 From here, one can traverse several smaller summits along the way to Høgeloft, the highest summit on Jukleeggi. Comments: I climbed this mountain solo on a cold, but beautiful winter day. I left Bergen around 0600, and arrived at the trailhead around 0900. The temperature at the trailhead was minus 20 Centigrade. I left the car at 0915 and arrived at the summit at 1200 noon. By then the sun was warming and fortunately, there was no wind. Fantastic views of Jotunheimen. Still, it was cold enough to make me leave at 1220, arriving back at the car at 1340. What a nice day this was. 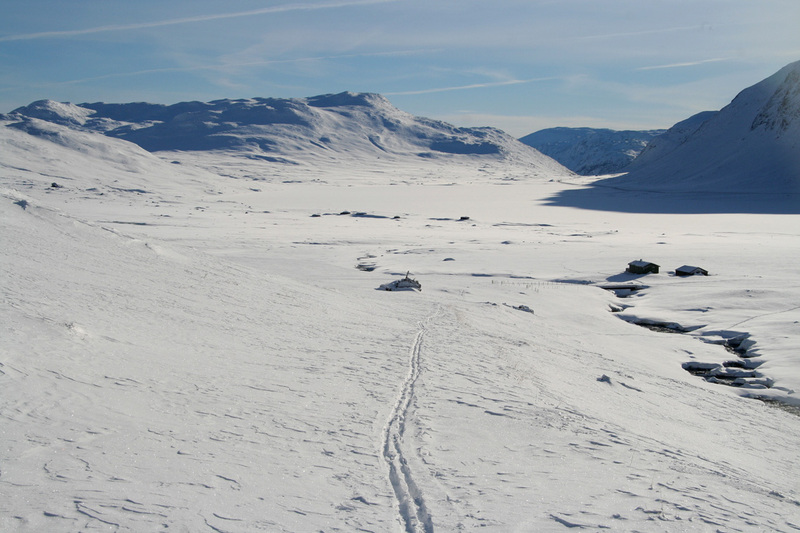 I started breaking trail across the west end of Eldrevatnet, then hit a ski track partially snowed in at the road. The river flowing down by Ulvehaugen was open with lots of water. I found a single snow bridge to cross (one may always use the road bridge). This is quite unusual at 1200 meter elevation in mid February. The ski track continued along the road, but vanished (due to snow drift) by the time I hit the bottom of the somewhat steeper west slope of Store Jukleeggi. There was plenty of new snow, so breaking trail required some effort. Once I hit the higher area, there were still a number of local hills with small valleys in between on the way to Høgeloft, the highest summit on Store Jukleeggi. I took pictures from the summit and had a small chocolate lunch, before the cold weather hinted that it was time to move on. This is indeed a very nice viewpoint. Even though there were a few clouds along the horizon, the view of Jotunheimen and Lodalskåpa as well as less distinct but pretty nice views also to the south and west just left you looking, then again and again. Another lasting memory will be the deep, white silence. No wind, no people, only new, fresh snow, the low sun and my single track in the snow. Jukleeggi as seen from near the trailhead (and Hwy. 52). What is visible is 1500-1600 meter, the highest point, Høgeloft, is about 4 kilometer further back. Masseringsnosi (1742m) in center. The river Ulvehaugelvi further right. The route runs up parallel on the right side of the river. Eldrevatnet (1106-1116) and Hwy. 52 connecting east and west of Norway. The west slope, I ascended quite a bit to the right. Hurrungane, while climbing the west slope of Jukleeggi. Near Ulvehaugen. Returning from a very nice day in the mountains. Hwy. 52 heading down towards Hemsedal in the distance. Jotunheimen, as seen from Høgeloft (4.3 MB). Jotunheimen, with names. (4.3 MB). Summit Panorama I, north (Jotunheimen) (1.8 MB). Summit Panorama II, east (2.1 MB). Summit Panorama III, south-east to south (1.9 MB). Summit Panorama IV, south to south-west (2.7 MB). Summit Panorama V, west (1.3 MB).